Also known as double roller blinds in Melbourne, dual roller blinds are a combination of two different types of fabrics on two roller blinds, mounted to a single bracket. Many people who are building a home, or simply renovating, are looking for cost effective and streamlined solutions to their window furnishing needs-which they are finding in dual roller blinds. Both minimalist, and simple, dual roller blinds are highly desirable as they allow you to install one product that can handle all the lighting and privacy demands in any room of your space. This works especially well in rooms utilised both day and night. Traditionally, you may have acquired a curtain for privacy at night, and kept either an exposed window during the day to allow natural light to illuminate your property, or a separate blind underneath. With dual roller blinds, not only do you enable light and privacy during the day, you still allow privacy at night, whilst maintaining a single mode of operation for your blind system. Due to the marriage between privacy and light that dual roller blinds bring with their presence as a window furnishing, you will save on energy during both winter and summer. The dual roller blinds provide a sort of economic insulation system. The protection from sun alone is great for reducing air conditioning and fan bills, driven by heat that infiltrates your home. A popular way of configuring double roller blinds is to pair blockout fabrics with sunscreen fabrics. This allows for optimum benefit to be gained from the system, allowing greater control over the ambience, temperature, and privacy in your environment. Traditionally, operation is driven via chain operated rollers that are smooth and easy to use, with multilink control systems that allow you to operate multiple blinds at once. If extended convenience appeals to you, you can opt for electric motor operation, commanded by a remote or hard wired switch. 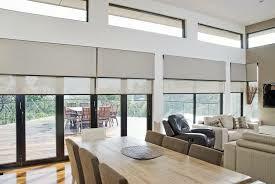 Nowadays, double roller blinds in Melbourne are available in a variety of colour schemes to suit your property. It is always best to consult an experienced blind company who are willing to help you figure out the best configuration for your home. The team at Tip Top Blinds are well known for the quality of their work in Melbourne and can provide you with the perfect solution and fit out for your needs. You can speak to them today on 03 9544 4999.